Design thinking is an effective and simple process for creative problem solving. We wanted to spread the love and get people to run design thinking activities on their own. So, we started with the idea of a toolkit that could be set up anywhere by anyone. The box was cumbersome, took up too much space and was difficult to transport. Users became overwhelmed by the large amount of content in the box. Confusion and frustration ensued. Our next challenge was to create a toolkit that was easy to understand and intuitive to use. After a quick brainstorm, we had a breakthrough. The base would be a banner with step-by-step instructions. It would include labelled pockets that marked stages in the design thinking process. And then we thought, what if the banner could fold into a bag? The final form of the toolkit is the result of several prototypes that we tested. We were happy that it is very mobile and intuitive to use. Our final challenge was turning our prototype into a beautiful, functional toolkit. Once we were decided on the material, printing method and final design, our next step was to search for local makers who could help make our toolkit a reality. Our search led us to Malacca, where we met with an amazing silkscreen artist named Joe. He helped us source for the perfect raw canvas material, and prototyped the first toolkit with it. Together with Mrs. Tan – a local seamstress, they constructed the bespoke bags that became the toolkit. We chose raw canvas because of its natural texture and colour. We think the small imperfections on the cloth adds to the character of the toolkit. The nature of the material does render it a little tricky to work with. So we’re proud to say that Joe and his team did an excellent job of printing and aligning each section of each individual toolkit by hand. The silkscreen prints used rich vibrant colours that Joe mixed himself using water-based inks (we think Joe’s a pretty talented guy). 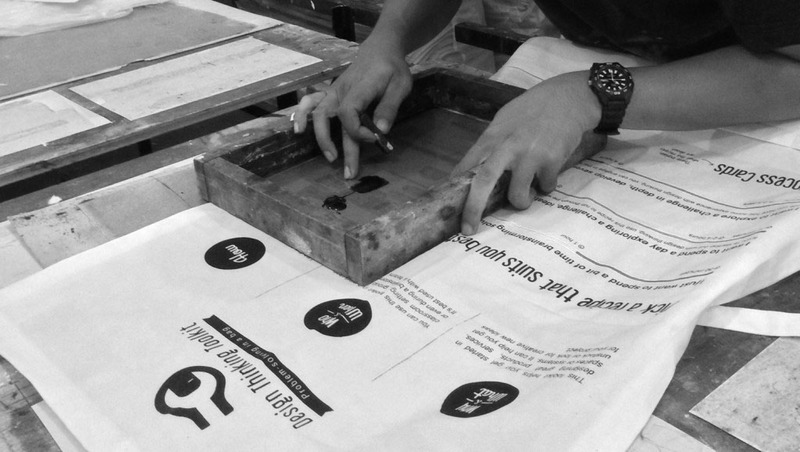 Another cool guy we know is Edmund, he’s a printer from Damansara Uptown who took a personal interest in our project. He went out of his way to help us source the material to print the Process and Method Cards that come in the kit. Design Thinking Toolkit is made with love by the Social Innovation Lab team – Kal Joffres, Chong Yong Yee, Adelyn Tam, Tang Pei Ying and Angela Low. We’re very happy to have met all the great people who have made this possible. So we hope you enjoy the Design Thinking Toolkit as much as we have enjoyed making it! A hand printed toolkit – silkscreened on raw canvas. Complete with a set of curated cards and a few essential tools to get your started. Design Thinking Toolkit is a product by Tandemic, an Asia-based innovation firm. We work with businesses, governments, and social organizations to solve tough problems, find new growth opportunities, and build in-house capacity to innovate.